Find out why Nintendo made General Pepper a dog. 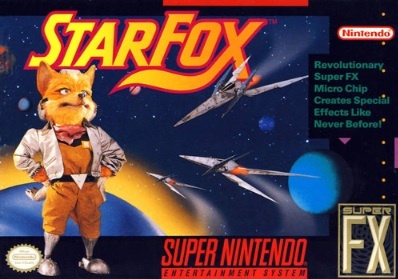 This year marks the 18th anniversary of Star Fox, Nintendo's original SNES adventure starring hero Fox McCloud. With this in mind, we tore through the virtual history books searching for some cool facts about the franchise, from the mysterious Star Fox 2 to the origin of Slippy. On that note, cram your brain with knowledge, and be sure to put Star Fox 64 3D (September 9) on your holiday wish list. -Shigeru Miyamoto was inspired to create the arches in Star Fox after visiting Japan's Shinto shrines. -The original Star Fox was Nintendo's first 3D console game. Fox McCloud, in puppet form. -In Europe, Star Fox and Star Fox 64 are known as Star Wing and Lylat Wars, respectively. -Fox McCloud's signature vehicle, the Arwing, got its name because it resembles the letter "A". -Miyamoto was a fan of TV shows featuring puppets, and designed the original Star Fox box art featuring a puppet of series' hero Fox McCloud. -Designer Takaya Imamura used a popular Japanese expression about fighting like dogs and monkeys as inspiration, which explains why the Cornerian army is full of canines that battle evil monkeys; General Pepper's a dog, Andross is a monkey. -A Nintendo employee used a toad as a personal mascot. As a result, Slippy was born. The famous Star Fox 2. -After launching the original SNES title, Nintendo partnered with Kellogg's and Nelsonic to create a Star Fox themed game watch consumers could send away for after purchasing a box of Corn Flakes. 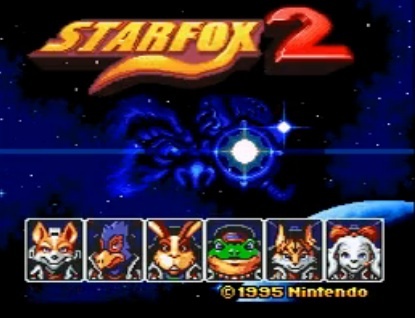 -Nintendo cancelled Star Fox 2 for Super Nintendo, despite being finished. That said, the company reused elements (at least 30 percent of the game) in Star Fox 64, most notably All-Range mode, the multiplayer mode and Star Wolf scenario. -Nintendo also cancelled Star Fox games for both Virtual Boy and the arcade. -After beating Star Fox 64, General Pepper receives a bill for the damage, which includes the number of enemies destroyed, multiplied by 64. If it's less than $70,000, Pepper says "This is one steep bill, but it's worth it." If the price is higher than $70,000, he says, "What?! ", and if it reaches a whopping $100,000, Pepper chokes. 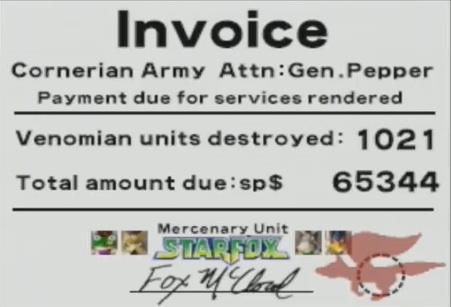 The invoice from Star Fox 64. -Star Fox Adventures on GameCube was originally known as Dinosaur Planet, a Nintendo 64 game that had nothing to do with the series. -Star Fox: Assault, also on GameCube, was first called Star Fox Armada. -At first, Slippy ended everything sentence with the word, "Ribbit!" This was later removed.